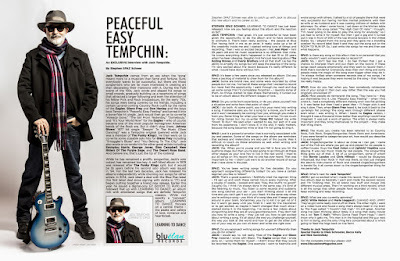 Discussions Magazine Music Blog: JACK TEMPCHIN: An EXCLUSIVE interview! 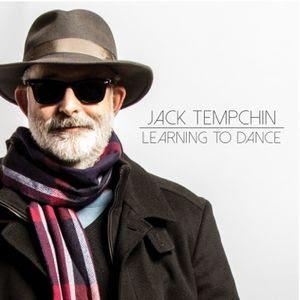 JACK TEMPCHIN: An EXCLUSIVE interview! Jack Tempchin comes from an era when the ‘song’ meant more to a musician than fame and fortune. Sure, everybody wants to be successful, but there are those songwriters who are far more interested in creating art than decorating their mansions with it. During the Folk scene of the ‘60s, Jack wrote and played his songs to small crowds, gradually building up a repertoire of songs that attracted a larger following and even the attention of his fellow Folk and Rock troubadours. By the early ‘70s, his songs were being covered by his friends, including a certain up-and-coming Country Rock outfit by the name of The Eagles. Glenn Frey and Don Henley and the boys took Tempchin’s “Peaceful Easy Feeling” and turned it into a bona-fide hit single. Jack would then go on to co-write “Already Gone,” “The Girl From Yesterday,” “Somebody,” and “It’s Your World Now” for the Eagles – who of course became one of the most popular homegrown American bands of the Rock era. But it didn’t stop there. Johnny Rivers’ 1977 hit single “Swayin’ To The Music (Slow Dancing)” was a Tempchin original (penned while Jack was a member of The Funky Kings). He then went on to co-write some sizeable solo hits for Glenn Frey including “Smuggler’s Blues” and “You Belong To The City.” Jack also wrote or co-wrote hits for other great artists including Emmylou Harris, George Jones, Glen Campbell, New Riders Of The Purple Sage, and The Desert Rose Band. And believe me, that’s just the tip of the iceberg! While he has remained a prolific songwriter, Jack’s solo output has remained low-key. A self-titled album in 1978 was released after The Funky Kings split, but it would be 16 years before his second solo album was issued in ’94. For the last two decades, Jack has released his albums independently while churning out songs for other artists. In 2014, Jack inked a deal with the Blue Elan label (his first label deal since signing with Arista in ’77) and began putting together a brand new release. Earlier this year, he issued a digital-only EP (Room To Run) and followed that up with Learning To Dance, an album rich with emotional songs that are definite Tempchin classics. While not exactly a “concept” album, Learning To Dance focuses on a central theme – the peaks and valleys of love, romance and heartbreak. STEPHEN SPAZ SCHNEE: Learning To Dance has just been released. How are you feeling about the album and the reaction so far? JACK TEMPCHIN: I feel great. It’s just wonderful to have been given the opportunity to do the album and to have someone to promote it. That’s been really exciting – the people at Blue Elan having faith in me as an artist. It really woke up a lot of the creativity inside me and I started writing tons of things and recording. Then I was so excited because I met Joel Piper – he’s 29 years old and his music experience is so different than mine. He knows everything that’s happened in the last 15 or 20 years when I’ve been sleeping. (laughs) And he’s just learning about The Rolling Stones and Everly Brothers and all that stuff. He has the ability to amplify my songs but still keep the essence of the song. I’m very excited about the record because it’s really different to what I would have done without him. SPAZ: It’s been a few years since you released an album. Did you have a backlog of material to draw from for this album? JACK: Some are brand new, and some were recorded by other people but not me. I’ve had all these songs that I wanted to record but never had the opportunity. I went through my vault and dug up some songs that I’d completely forgotten – I rewrote some of them. As things started to take shape thematically, it turned out to be an album about the different stages of love. SPAZ: Do you write from experience, or do you place yourself into a situation and write from that point of view? JACK: I do both. At some point, you trick your mind into writing a song. If someone asks you for a song for a movie, you’ll write it and it won’t necessarily be coming from you, although you make it from you. Same thing for when you have a co-writer. I’m not much for riding horses but my co-writer Carey Ott helped me write “Room To Run.” We said what I wanted to say, but part of it was from his experience. I don’t know if, in the end, it really matters, because the song becomes mine or else I’m not going to sing it. SPAZ: Love is a powerful emotion that is normally associated with joy and passion. Some of the songs on the album are reminders that sadness and melancholy are also part of the puzzle. Was it difficult to touch on those emotions as well when writing and recording the album? JACK: Yes. When you’re young and you fall in love you hit the euphoria stage. But then you’re also going to go through all these other stages as your love has to live in the real world. I tried to put all songs on this record that no one has ever heard. That was important to me – I didn’t just want to do another record of songs that I have done in the past. SPAZ: You’ve been writing songs for five decades. Do you approach songwriting differently today? Do you have a certain regimen you like to follow? JACK: That’s a good question. I faithfully tried the regimen thing – I’d get up and work these certain hours every morning. After a couple of weeks, I looked and said, “Hey, this stuff’s no good!” (laughs) So, I think I’ve always done it the same way. It’s kind of like listening to music. You listen to some records and suddenly one song catches your ear – you start thinking about it all the time and you can’t get it out of your head. It’s the same way when you’re writing a song – you think of a song idea and it keeps going around in your brain. Sometimes, you try to kill it or get rid of it but it won’t go away until you finish it. I wait for the inspiration or to get excited, so maybe it hasn’t changed that much since I started doing it in the beginning. I’ve done a few videos about songwriting and they are at www.gowriteone.com. They don’t tell you how to write a song – they just tell you how to get excited about writing a song. It’s all about the way you challenge yourself, the way you look at the world and how to get all the other junk out of your way so you can sit down and write one right now. SPAZ: Do you approach writing songs for yourself differently than you do for others? JACK: I would say no, not really. Most of The Eagles and Glenn Frey material, I wrote with Glenn. The Eagles songs that I wrote early on, I wrote them for myself – I didn’t know that they would be recorded by The Eagles. One example: I went to Nashville and wrote songs with others. I talked to a lot of people there that were very successful but having horrible marital problems with their ex-wife or ex-husband and it was costing millions of dollars with attorneys. So, when I came home, I sat down at the kitchen table and I wrote this song called “The High Cost Of Hate.” I thought, “I’m never going to be able to play this song for anybody,” so I just had to write it for myself. But then I got a gig and it turned out it was in front of 200 of the top divorce lawyers in the United States. So, I played them the song and they gave me a standing ovation! My record label liked it and they put the song out on the Room To Run EP. So, I just write the songs for me and then see what happens. SPAZ: Is there any song on this album that is so personal that you really wouldn’t want someone else to record it? JACK: No, I don’t feel like that. I do feel thrilled that I got a chance to interpret them and put them on the record. If these songs reach people emotionally and they want to record them, I think that’s wonderful. Everybody does their own thing and some people make the magic of the song even bigger when they do it. I’m always thrilled when someone records one of my songs. I’m hoping it was because they were moved by the song – that makes me really happy. SPAZ: How do you feel when you hear somebody reinterpret one of your songs in their own way rather than the way you had originally envisioned it? JACK: Most people do reinterpret the song. They have to – they put themselves into it. Like “Peaceful Easy Feeling” – when I first wrote it, I had a completely different melody and I was flat-picking it. It was faster but then I had a great idea – I’ll finger pick it and sing it slow. Then, when Glenn Frey heard it, he took it back to the up-tempo flat picking! The song went through different phases even when I was writing it. When I heard The Eagles version, I thought it was a thousand times better than anything I could have imagined. It was just a work of genius. The artist is always really important and they bring themselves to the project – they make that thing theirs. SPAZ: The music you create has been referred to as Country Rock, Folk Rock, Singer/Songwriter, Roots Rock and Americana. If you were forced to categorize your art, how would you describe it to somebody? JACK: Singer/songwriter is about as close as I can get. I came out of the Folk era where you got up and played for six people in coffee houses. Guys like Hoyt Axton and Lightnin’ Hopkins were playing. It was real music made by real people. The songwriting thing grew out of that. A lot of us songwriters, some of whom – like Bernie Leadon and Chris Hillman – would be Bluegrass influenced. But then Rock ‘n’ Roll was there, so that just merged the electric instruments of Rock and created singer/songwriters in bands! So, it all comes down to the singer/songwriter thing for me personally. SPAZ: What’s next for Jack Tempchin? JACK: I got so excited when I made this record. They said it was a two album deal so basically I went and made the second record, and I’m finishing that. It’s all brand new stuff and moves into different musical areas. Then I’m working on a third record, which is all the songs that other people have recorded of mine. I just keep working and keep recording. SPAZ: What are you currently spinning? JACK: Willie Nelson and Merle Haggard’s Django And Jimmy. They’ve got some really cool stuff on there. The other night, I went on a video hunt and found a song that’s always been in my brain by The Fugs called “I Couldn’t Get High.” It’s still great. Another song I’ve been thinking about lately is a song that really moves me a lot: Tom T. Hall’s “Who’s Gonna Feed Them Hogs.” I don’t know why it gets me. This man is in the hospital and the guy next to him is dying, and the only thing he’s concerned about is who’s going to feed the hogs back on the farm!